With the continuous innovation of technology, our septic tank research technology has also been greatly improved. Now our FRP septic tank is gradually replacing our traditional septic tank, just take our new land FRP septic tank to tell you Let's talk. 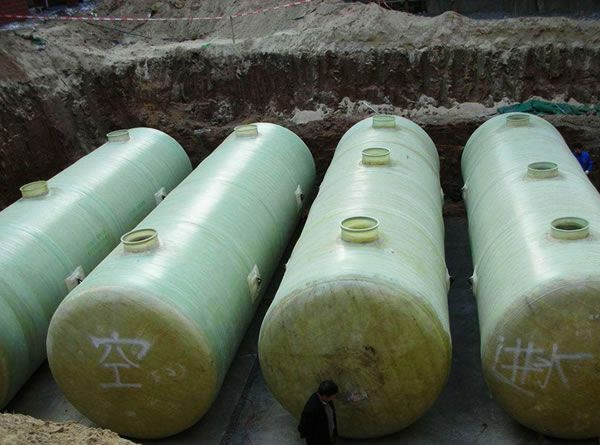 FRP septic tank, which is made of high-strength resin and glass fiber filament, is produced by mechanical winding. At the same time, we also strengthen the rib structure design. The whole production process uses integral molding technology because there is no seam. Therefore, it does not leak, and thus has no pollution, good sealing performance, strong bearing capacity, high-cost performance, convenient installation, acid, and alkali corrosion resistance, and effectively improves construction efficiency. Our new large-scale mechanical FRP septic tank, the appearance of the drum design, the barrel is provided with ribs, the two ends of the head for the wheel design, high compressive strength, acid, and alkali corrosion resistance, the normal service life of up to 50 years the above. The inside of the FRP septic tank is provided with a partition, and the water passing holes on the partition are displaced up and down to form a swirling flow, which avoids the short circuit and prolongs the actual residence time of the sewage; at the same time, the partition divides the whole tank into a plurality of parts: Multi-stage biochemical chamber, clarification chamber, etc., biochemical interior is equipped with high-efficiency "bio-filter", and a large number of microorganisms are attached to the filler, so that the contact area and time of sewage and microorganisms are greatly increased, and the reaction efficiency is greatly improved. To remove solid and liquid organic matter in the septic tank, to reduce and harm the sludge, and to treat the effluent to meet the national discharge standards of the third, second, first or middle water reuse standards, for sewage The subsequent deep processing laid the foundation. This product has a small footprint and good environmental protection benefits. It is especially suitable for the establishment of septic tanks in the sewer system of new and old urban construction areas, which has the advantage of flexible site selection. In the underground pipeline network of gas, electricity, telecommunications, tap water, rainwater, geothermal air conditioners and other places in the residential area project, the saved land can improve the conditions of the pipeline network facilities. The economic index of this product is lower than the final price of the reinforced concrete septic tank, which is basically the same as the brick pool. After treatment, the water quality can reach the national secondary emission standard. It is affordable and affordable to users and is supported by numerous companies and construction companies. Copyright Hengshui Jiubo Composites Co.,LTD. All rights reserved.